I bet your wondering why we would introduce a glaze with a name like Fired Snow right as the weather is starting to turn to spring. Well its turns out bunny rabbits and spring go together and Fired Snow adds a billowy white texture to the ceramic surface its applied to. Among other things, its perfect for making clouds, bunny tails, kitty cat cheeks and, of course, snow. Having the consistency of paste, its easy to work with and is a great way to add an extra little touch to your piece. Here’s a quick tutorial on how to use and apply Fired Snow. 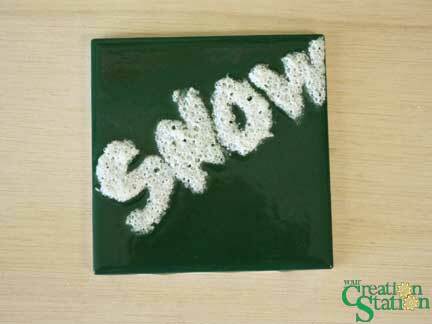 For this example we will be using the Fired Snow to paint the word “SNOW” on a tile. We’ll start with a tile that’s already been covered with three coats of a dark green underglaze (CN173 – Dark Kelp) so the bright white of the snow will really stand out. After the underglaze dried, I wrote the word “SNOW” with a magic marker to get an idea of who much room I had and to use as a reference. The snow should be the last thing you apply to your piece before it gets dipped. It has the consistency of paste and can be applied with your fingers and/or some other tool, like a popsicle stick. I like to use the popsicle stick to scoop some snow out of the container and then use my fingertip to smear it where I want it. During the fire, the paste will expand a little so you don’t need to add too much but you’ll need enough…I would say probably not much thicker than about 1/16th of an inch. The texture of the paste can be either smooth or rough as you like. That’s about all there is too it, it’s not really all that hard to do. Once the snow is applied, the piece is dipped as it normally is and goes into the kiln. The magic happens during the fire when the snow melts, expands, texturizes and then freezes up again into its final form. The other really cool thing about the Fired Snow is how everyone is using it.